After all the devastating floods in the Houston area, I got a bit nervous and thought I’d do some research and see what my flood risk might be. Here’s a good story on why Houston is so prone to flooding. I found a site – http://www.whatismyelevation.com/ that allows you to enter an address and it will give you it’s elevation. Type in an address to start and then you can compare your elevation to surrounding areas. Here some general elevation figures from my area. My house is at an elevation of 636 feet. The elevation is 607 feet in the other direction. The elevation at Gravois Creek is 492 feet. While the above won’t give you an absolute risk assessment, it will give you an idea of what your risk might be. I’ve had a number of acquaintances have the problem of not getting up after a fall. I’m providing this information for their use. How to help someone up. One of my yearly chores is to scan the contents of my wallet and keep a copy in a secure location. My scanner allows me to make multiple scans and save it as one PDF image. You can then either print a copy for a safe deposit box or encrypt the file and keep it with your valuables. Hopefully you will never need this backup, but there’s always a chance and then you will be really happy you have this backup. After a disaster, there is a good chance that you won’t have many of the necessary papers and documents you may need to get your life back into order. 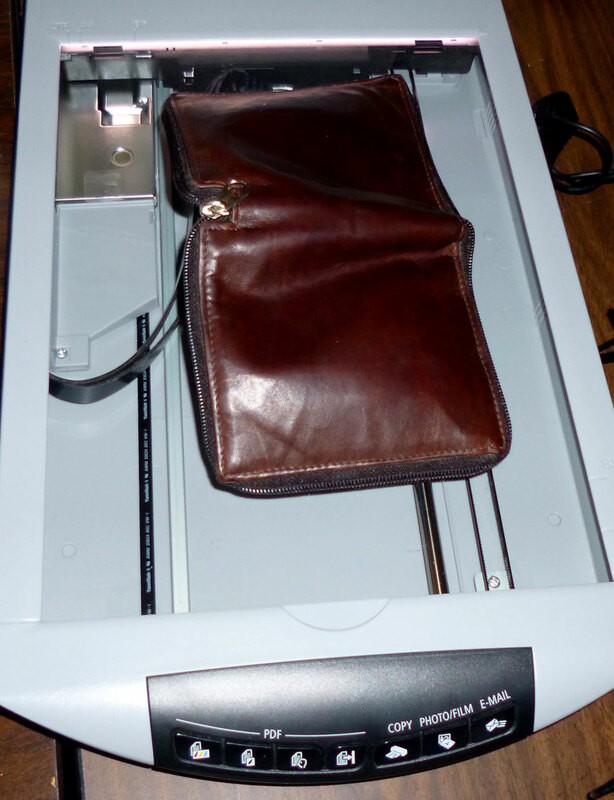 One way around this is to scan your documents NOW and then use Google Drive as a way to store those documents. A Google account and Google Drive is free for up to 15 GB. Here’s another extra step you can do to make your files even more secure. Encrypt your files before you drag them over to Google Drive. The program I use is Axcrypt. I put all the files I want to encrypt in one folder and then choose them all and encrypt them all at one time. Then drag the files or upload the files into Google Drive. Now your files are doubly encrypted and even if your Google account is compromised, your sensitive data is safe. To Erase files from your computer, you can use the Eraser program from SourceForge. One of the suggestions I recently heard about is the need to secure your portable generator or it may easily be stolen. I found a number of solutions. 1. Did a deep hole, fill with concrete and a bolt attached to a chain. 2. Have an alarm by the generator to let you know if anyone approaches. 3. One suggestion was to only run the generator when you could watch it. If you can’t watch it, put it away. I’m posting a few videos on doing CPR. Here’s a fact sheet to read. Here are the three steps. Push hard and fast in the center of the chest until help arrives. 100 beats/minute – song Staying Alive. One of the Doomsday scenarios that will happen at some point are Solar Flares and Cornonal Mass Ejections (CME) that will impact our electronics and the electrical grid. According to Wikipedia, there was such a storm in 1859. NASA.gov has an article about solar activity which says it would take 4 to 10 years to recover and initially cause up to 2 trillion dollars in damages. In 1989 Quebec had a 9 hour power outage due to solar activity. With that as a background, I wondered what actions ordinary people could do to be proactive. One warning I found available is from NOAA. You can signup for email alerts about solar activity. Here’s a response I received from them. Once you have signed up, you can go in and add different products that will notify you of the potential geomagnetic activity (aurora). Subscribe (add or change subscription preferences) Then go to the Geomagnetic Storm Products section. Here is where you will actually select the products you wish to receive. If you are in an above of about 40°N/S, you should probably subscribe to everything from K=4 to the G5 warnings and alerts. If you are farther south, it is less likely you will see any impacts with anything less than a G2 or more. There are always exceptions, so if you want to subscribe to everything, feel free. 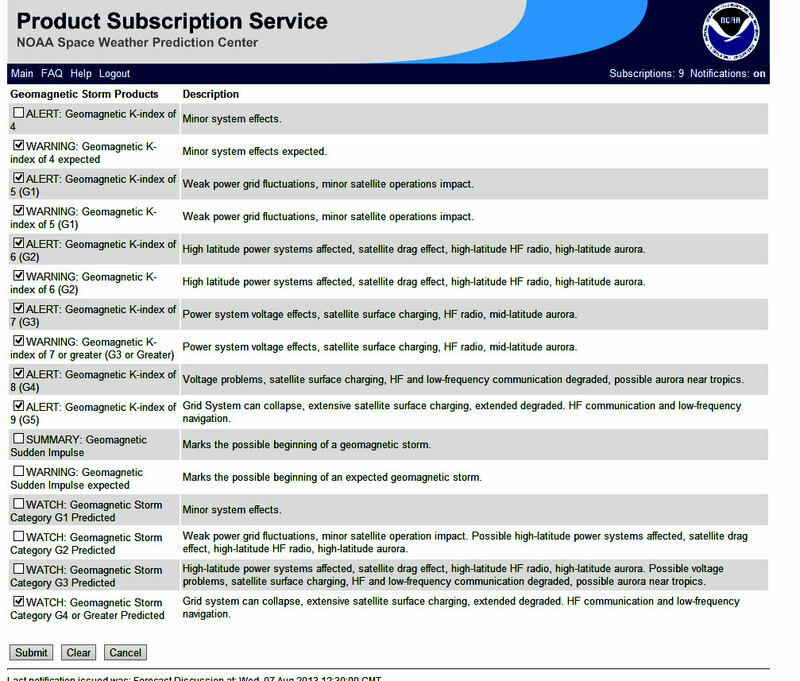 Here’s a picture of the subscriptions for Geomagnetic Storms. I you look at a Geomagnetic Storm of Category G4 – it says “Grid system can collapse.” That’s about as bad as it gets. “You are actually pretty close with your timing estimates. Depending on the location of the flare/CME when it departs the sun, the speed of the CME, the background solar winds, and if there has been anything (coronal hole, CME, etc.) immediately preceding this particular CME that would “clear things out” so there was nothing slowing the plasma blob down. The immediate hazard (within tens of minutes potentially) would be energized particles (protons). They would mainly be hazardous to astronauts, satellites, and high flying aircraft. Our ionosphere and atmosphere do a pretty good job of protecting us from these particles. The next hazard would be the geomagnetic storming that occurs when the CME hits our ionosphere, bends the Earth’s magnetic field lines as it passes, and there is a re-connection of these field lines. This is what causes the aurora and is what produces the fluctuations to the power grids that can be detrimental to the transformers. This can occur anywhere from 15-18 hours to a few days. Thankfully, most of the power companies have taken a serious interest in space weather and have subscribed to the same alerts you can subscribe to. They are on a very short list of people we physically call to make sure they get the information we disseminate in a timely manner. In any case, hopefully I have answered you concerns in a not so short way. I think you may find some of our educational information interesting, and possibly helpful, when deciding what to look for with space weather. Check out the link below. It has several interesting articles as well as explanations of some of the things we do. You can also look at the Space Weather Prediction Center to get a timely update. I thought I’d also start a discussion of what anyone can do if they get such an alert and what actions to take in that short period of time before the storm hits. I’m going to assume you already have your regular Emergency Supplies and Food. – see my list. Money – go to the bank and withdraw almost all your money. You can always put it back in, if things turn out OK. Obviously smaller bills are better. This is one reason to deal with a local bank. Just drive over and get your money. There may be a run on the banks – so be one of the first to get there. They won’t have enough money for everyone. Water – start filling up every thing you have with water – bathtubs, pools, containers etc. Buy new containers like trash cans to fill up while the water is still flowing. Buy extra bleach for cleaning bad water. Food – make a run to Costco or any store where you can buy large quantities of food. That 7 day supply of food in the basement is not going to last very long. Gas – fill your car. Buy and fill as many gas cans as you can get your hand on. Protection – you may need to protect your house and family – have adequate protection. Question – what else needs to be on the list? I was doing some research on Living Wills, Medical Directives and Power of Attorney for Health Care and here’s a site I found which seems to have forms for all states. Here is the Missouri PDF form. It looks like Missouri requires a Notary for the Durable Power of Attorney for Health Care – so plan ahead. I also have a form I can email you I got from my doctors office. Here are some condensed material from FEMA on how to prepare for an electrical outage. Important Phone Numbers – put these into your cell phone ahead of time. Phone numbers listed are for St. Louis MO. • Electric company phone number/Website: Ameren MO – 800.552.7583. If you use medical equipment that requires electricity to operate, register with your power company and health care provider to learn about alternatives. • If there is a utility outage, who may need extra support because of their functional or medical needs? • Does anyone in the neighborhood have special skills who can help others? 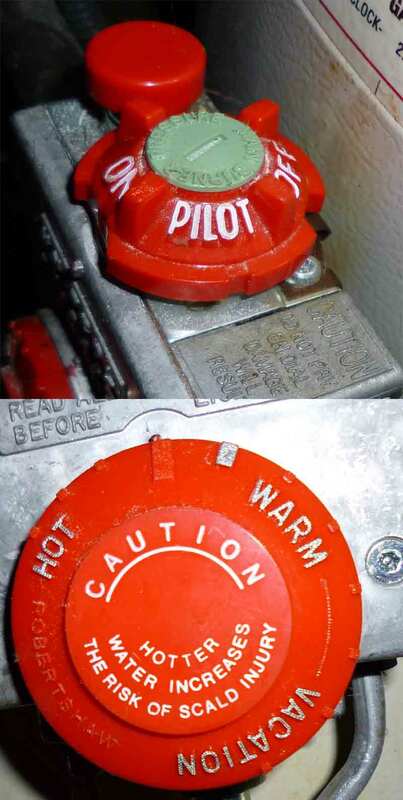  Locate and label utility shutoff (see diagram at the end of this handout).  Post instructions next to fuse box or circuit breaker.  Do not use candles. They are a fire hazard.  Keep on hand ready-to-eat meals that don’t require cooking or cooling.  Freeze water in plastic water bottles or old milk containers, leaving about an inch at the top for frozen water to expand. When placed in a refrigerator and freezer, they will keep food cold for several hours.  Know where to get dry ice to keep food cold as necessary.  Find a new or used battery-operated radio to get updates on information, shelters, etc. wood, pellets, or heating fuel? on how to use it and practice! • Are all the pots and pans off the stove? 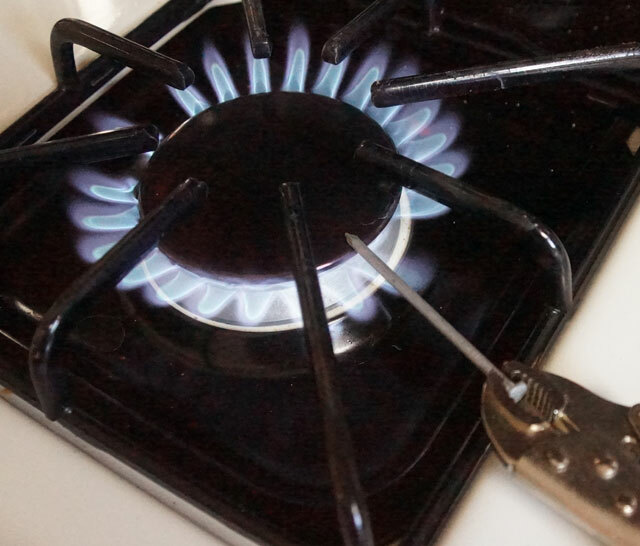 Are the stove range and oven turned off? flammable objects. Keep it unplugged when not in use. in the heat. In hot weather, minimize heat by closing shades, curtains, and louvers. instructed to by local authorities. Also see “Electricity Outages” above for more tips.  Locate and label main water cutoff. Make sure any special tools needed are stored nearby.  Have 3 days ( I’d recommend having at least a weeks worth of water) of drinking water stored (1 gallon of water per person per day). If pipes may freeze . . .
• Wrap insulation, tape, newspapers, or rags around them. • Store water in buckets or bathtubs to flush toilets. • Leave water trickling out of the faucets. If pipes do freeze . . .
• Remove any insulation or newspaper and wrap them in rags. starting with where they are most cold. If you have electricity, try using a blow dryer. If pipes burst . . .
turn on smaller breakers, one at a time. Step 1: Shut off individual breakers. Step 2: Shut off main breaker. Step 1: Pull out individual fuses. Step 2: Pull out main fuse. gas from inside the building if gas may be in the air. cannot extinguish, call 911 and turn off the gas only if it is safe to do so. to the chart below to know when to save food and when to throw it out. MEAT, POULTRY, SEAFOOD: Any raw, leftover, or thawing. cans that have been opened, fish, or meat sauces. FRUITS: Juices, packaged fruitsRefreeze. However, home or commercially packaged fruits will have texture and flavor change.Refreeze. Discard if mold, yeasty smell, or sliminess develops. Here’s a list of sites that I have found useful. Know How Show – please watch the video. I received an email from FEMA about a webinar they held on Financial Preparation for Disasters and Emergencies. Below are the relevant links on this topic. This has a lots of great information. take the time to go through it and make sure you are prepared financially when a disaster/emergency strikes. View the recording – audio and slides. Download Transcript – same link as above. Where to Keep Copies of Your Passport-Driver’s License etc. On many emergency type sites, they recommend keeping copies of your passport, drivers license etc. While paper copies are certainly acceptable, there is another option you can use if you’re careful – online. The question is where online since you want this sensitive data to be secure. One solution which was shown to me, via the Security Now Podcast. was LastPass. I use LastPass as a way to remember the hundreds of my many and varied passwords. One of the other great features they have is that they also have what is called Secure Notes. With Secure Notes you can keep other sensitive data and attach scans of important documents either in pdf or jpg format. One limitation is that a single note can hold up to 10MB of attachments, so depending on the size of your scans, you may need to create more than one secure note for your valuables. Currently, free users have up to 50 MB of encrypted file storage, and Premium users have up to 1GB encrypted file storage. LastPass Premium only cost $12/year so it’s a good way to support the company and protect your data. LastPass seems like a great solution for backup of sensitive data. I thought I’d do a few calculations here to figure out how much food one person needs to store for emergency situations. 1/4 cup uncooked rice = 160 calories. Figuring that one person would eat 2000 calories/day – that’s an average obviously. 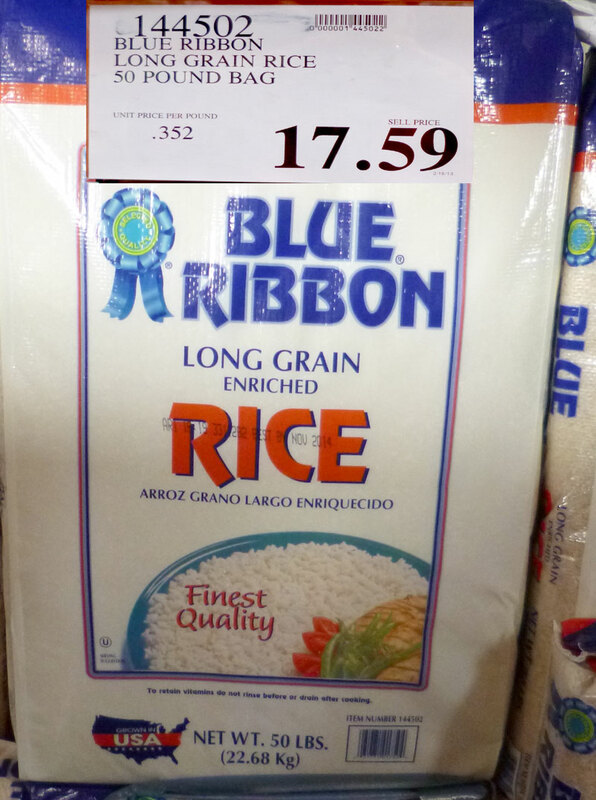 Therefore 500 servings/12.5 servings a day = 40 days one person could survive on rice alone. You also need other foods to fill in and supplement, but rice does seem to be a cheap and long lasting emergency food. Generator Transfer Switch – How to get power from your generator to your house. When the lights go out, even though you have a generator, the question remains – how am I going to get the power from the generator to the house? Obviously you could use a lot of extension cords, but your furnace won’t plug into an extension cord. One solution is to install a Transfer Switch. 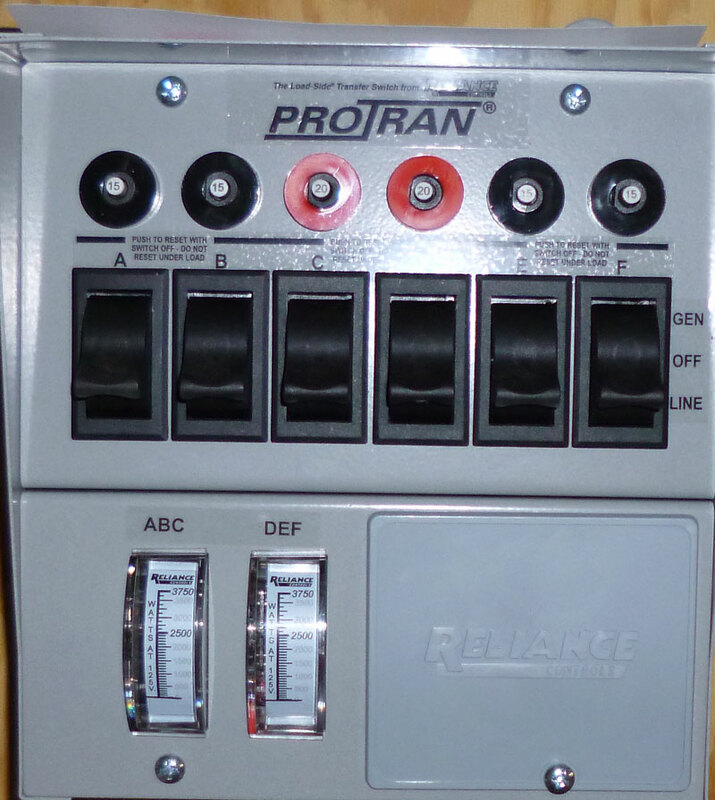 I bought the Reliance – 6 circuit for generators up to 7500 watts. The thing that greatly impresses me about this product are the great videos which are available online. You can find them on YouTube (holisticplanthealth)or the RelianceControls website. I did have an electrician do the connection to the main fusebox, but I did a lot of the other work. The only suggestion I have is that instead of cutting the wires short, keep them long so that during a loss of power if you decide you want to change your mind about the circuits, you can just move the wires around. Right now I have the two furnaces wired up, but during mid-July I might want to run an air conditioner. I also had trouble drilling into my concrete. If you rent a hammer drill, not a cheap one, it will be worth the cost. I put up a piece of 3/4″ plywood and screwed my box into it. I also connected my outside plug to the transfer switch before connecting it to the main box. The video connects the main box first and then the outside connector box. You will also have to do your homework and figure out which circuits are critical and balance your load. My wife and I got on our phones and turned off each circuit to figure out what each controlled. I was listening to a law officer talk about five actions that could save your life if there was a shooter in your house/building etc. 1. Don’t cower – act – run – take action. 2. Run across the line of fire. You want the shooter to have to move and constantly change aim. 3. Distract. If possible throw something at the shooter. 4. Distance – get as far away as possible. 5. Cover – get a brick wall/concrete between you and the bad guy. 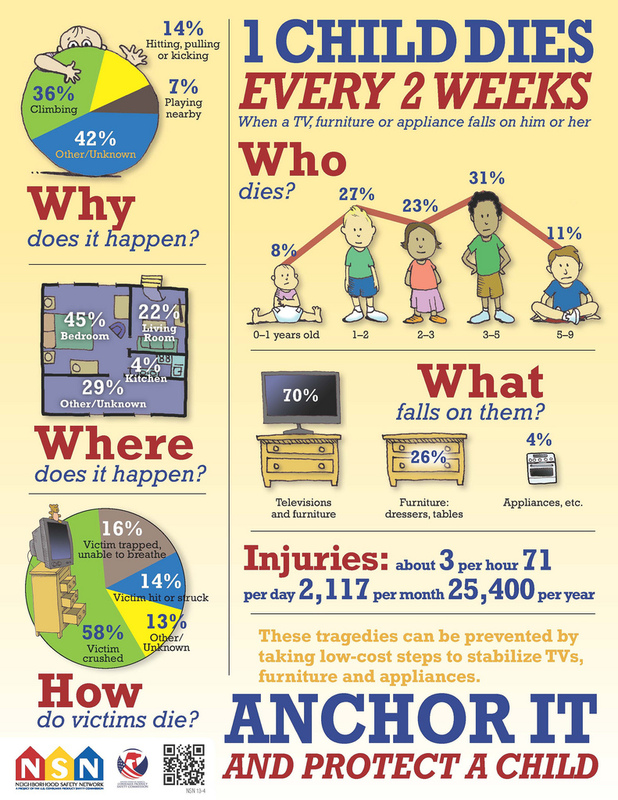 I saw a recent news item saying that 41 kids this year were killed by TVs and heavy furniture falling on them. I decided to see if I could make my own device to secure my TV’s. Here’s my end result – now I’ll tell you what it involves. The first thing I noticed was that my Samsung TV had four large bolt holes – the question was, “What size bolt do I need?” After doing a bit of googling, I decided on an M8 bolt. I went to the hardware store, bought four and tried to install them – no luck. They would not screw into the back of my TV. 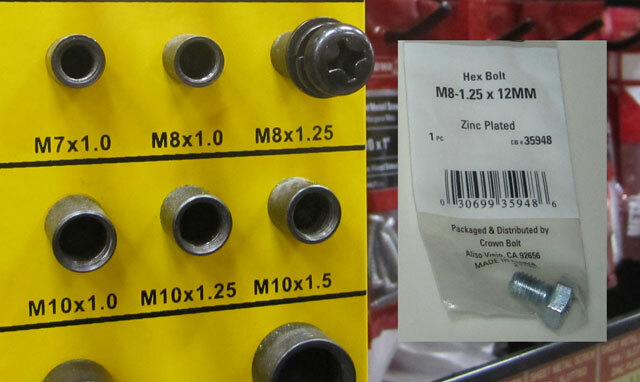 I went back to the store and found out that there are two different types of M8 bolts – 1.00 or 1.25. The difference is the type of thread on each bolt. I tried M8-1.25 and it was perfect. My next consideration was how to attach something to the TV. I found some nice webbing on Amazon and bought two kinds to test each out. The thinner and less expensive webbing works just fine. I also bought a 3/8 inch grommet kit to make grommets for the webbing. I heated up the grommet cutter and used it to melt the hole for the grommet. 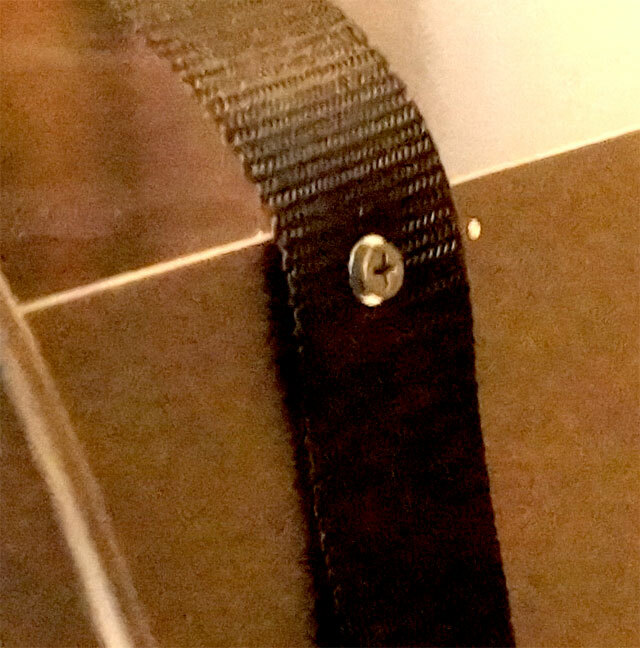 To attach the webbing to the cabinet, I heated a nail and punched a hole in the webbing where it would attach to the cabinet. I then drilled a small pilot hole in the cabinet and used a 1 1/8″ drywall screw and a washer to secure the webbing to the cabinet. 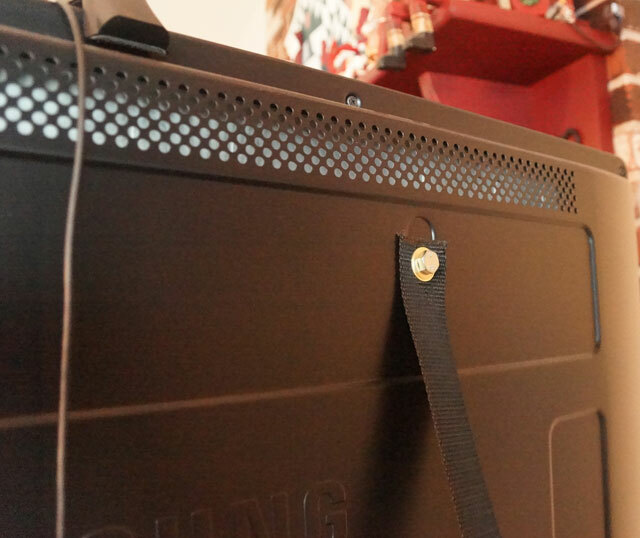 I did leave a little slack in the webbing just in case I needed to turn the TV slightly. 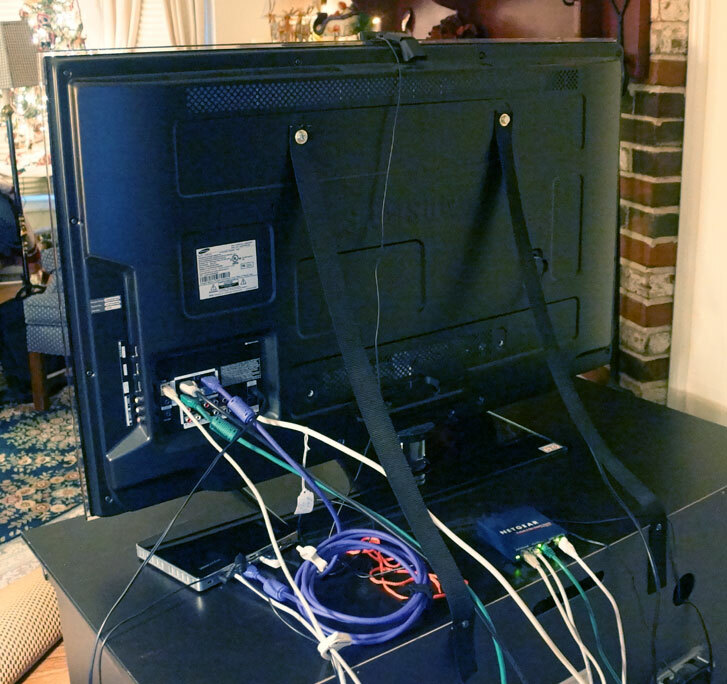 This solution is only meant from keeping kids from pulling the TV over onto themselves. It is not meant as an earthquake solution. Note – I’ve found a product on Amazon which will do basically the same thing. It’s the Kidco Anti-Tip-TV-Strap-Pack. 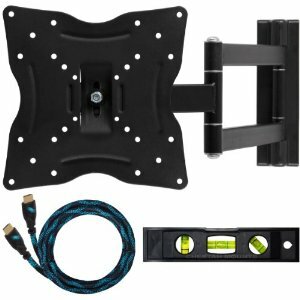 Another more simple option is to buy a TV Mounting kit and attach it to the wall. Even if you don’t plan on using the kit to hold the TV, it will keep it from falling over. Here’s a kit I ordered from Amazon for only $28. This particular kit is for smaller TV’s. I’m using this solution for the basement TV.